With the change in seasons comes the inevitable update of both my handbag and what’s inside it. I’m still clinging on to the idea of warm Autumn days, but realistically I’ve got the heating on and I’m already whipping out the intensive overnight creams to counteract the chill in the air. 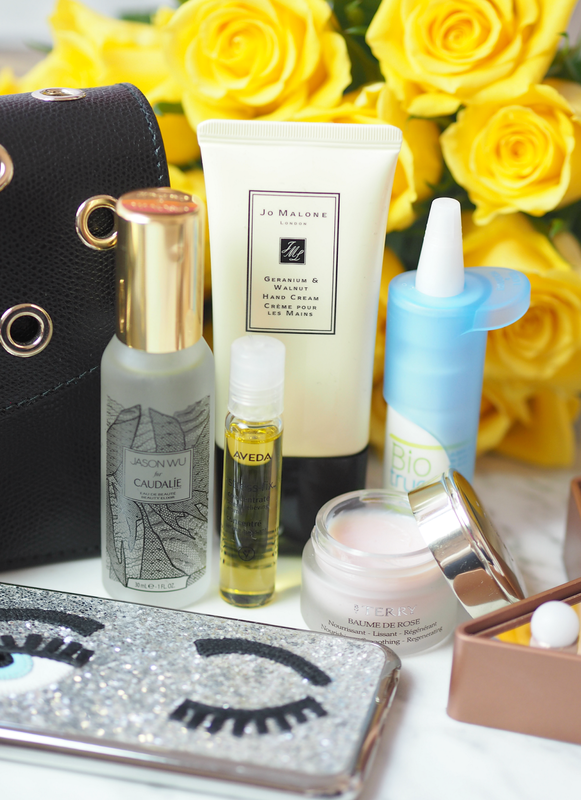 Continuing my new ‘handbag essentials’ series, I thought it was time to share what products I’ve been carrying around to help me transition into the next season while still feeling a little bit fresh and energised. Infused with the scent of geranium and walnut, as well as the soothing benefits of apricot kernel oil, this light and delicate formula helps to leave hands feeling moisturised instantly. Interestingly the scent was developed to complement each and every Jo Malone London fragrance, meaning it won’t overwhelm the senses or conflict with your perfume – definitely a selling point. 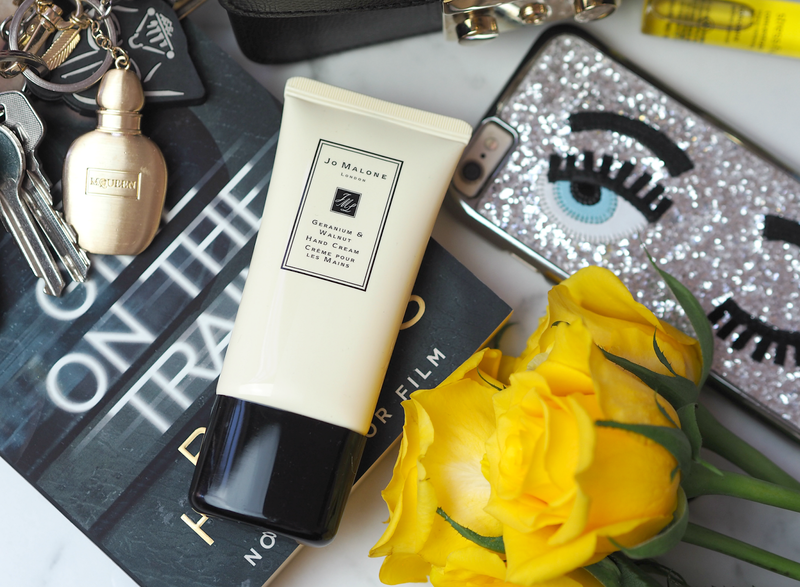 Although nobody *needs* to spend over twenty quid on a hand cream, sometimes a little moment of luxury is all you need to perk you up on a busy day. Possibly the most extravagant and over priced lip balm I own, this By Terry classic is becoming somewhat of a handbag staple despite its price tag. However, this isn’t just another lip balm – it’s made from rose flower essential wax, shea butter, ceramides and Vitamin E to boost cell renewal, soothe lips and fortify this delicate area against the signs of ageing. It’s super rich and creamy, leaving just a hint of colour on the lips that only enhances their natural appeal; I love the fact that it cares for my lips now and over time too, as well as being in a pot that so big I’ll be amazed if I ever get to the bottom. The ultra nourishing salve can also be used on dry patches and cuticles, so it’s a fab one to pop in your bag every day. Containing 100% organic ingredients, this rollerball concentrate offers an aroma clinically proven to relieve feelings of stress – somewhat essential when traveling to London multiple times a week. Including French-sourced lavender, lavandin and clary sage from small organic farms, the aroma is beautiful and instantly helps to relax my mind before I crack on with the tasks at hand. I’ve loved this formula and scent for many years and often drop a little into my bath, but this travel-friendly version means I can take it with me wherever I go. Great for nervous travelers, flights or long train journeys – or just the Underground. Traditionally more of a summer product, I actually like this all year round thanks to its refreshing and uplifting skincare benefits. A little spritz will not only cool you down and refreshen makeup, but it helps to infuse skin with moisture and tighten pores. It’s a great one to carry with you for emergencies when you’re starting to feel a little flustered, your makeup starts to look a little tired or you just need a boost come 3pm. 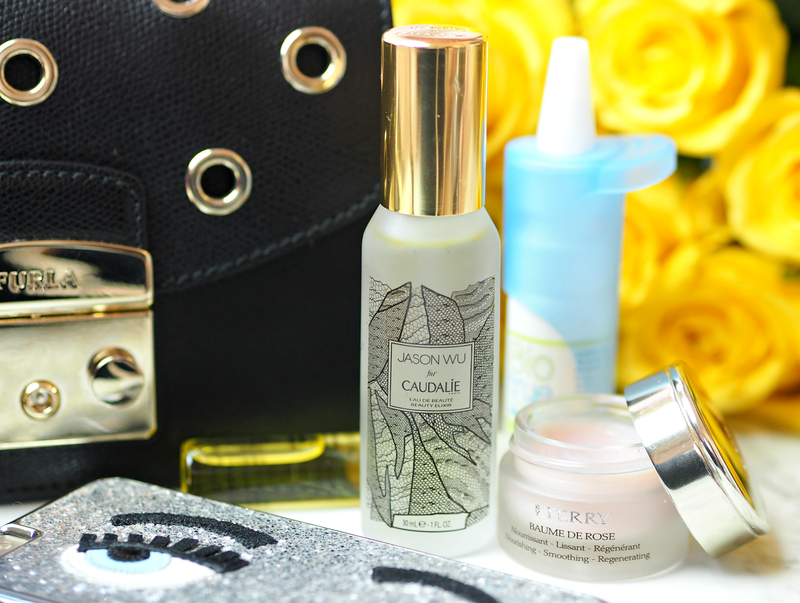 What’s even more exciting is that Caudalie have teamed up with fashion designer Jason Wu to create a limited edition bottle that’s even more handbag friendly than usual. I’ve been having lots of problems with my eyes recently, thanks to a lash lift that went a bit wrong and caused the surrounding areas to blow up and become irritated. I’ve been reaching for these re-wetting drops to soothe dryness and reduce irritation, as well as helping to wash away any nastiness that I often find around my lids (nice.) With a high concentration of hylaronic acid (used in skincare to attract and retain moisture,) this sterile bottle helps to provide instant relief when I need it. Unlike a lot of other drops, which are easily contaminated and need to be thrown away quickly, this has been designed to remain usable for longer. 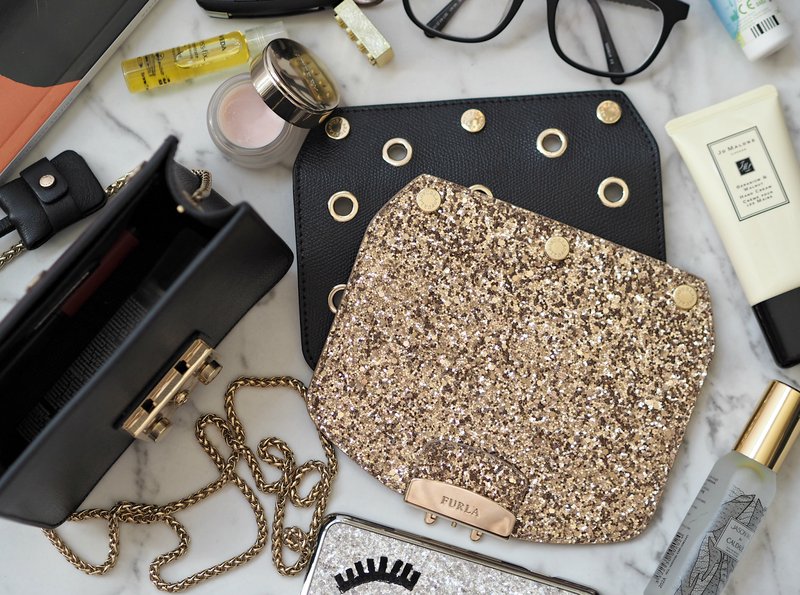 Phone cases are totally my jam and I’m currently falling back in love with this sparkly number from the Chiara Ferragni collection. Yes, it’s pricey for a phone case, but my oh my does it make a statement. I’ve spent £10-15 on cases before and got bored of them in a week, whereas this just keeps giving me far more pleasure than a phone cover should; it’s available in so many sizes, styles and colours, so grab yours quick and bling up your bag. One of my purchases in NYC this summer, I’m utterly obsessed with this bag and the concept behind it. How many times do you make an investment purchase but then realise it doesn’t go with as many outfits as you initially anticipated? 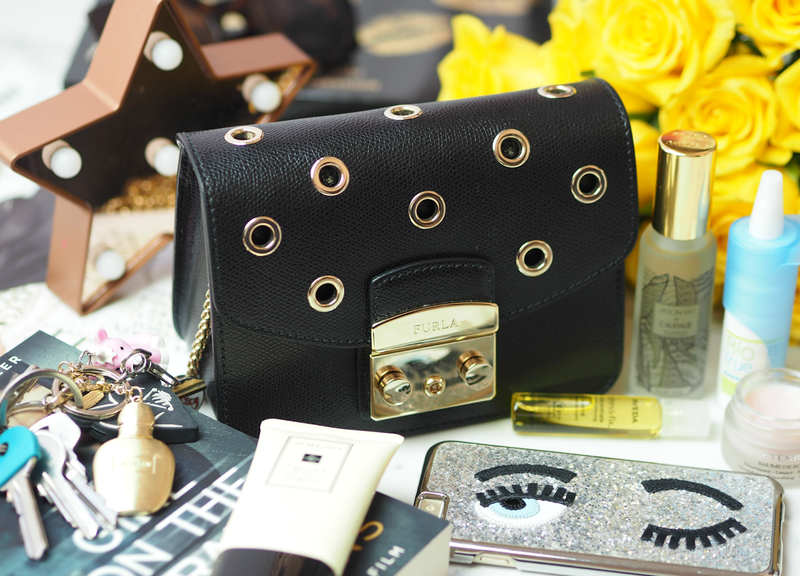 Furla have identified that frustration and created a range of changeable bags where you can pop off the flap and change it for another – genius. Available in black, white and blush with a multitude of flaps in everything from plain leather, metallic, glitter, animal print and laser-cut, there’s a way to get the most out of your bag with just a little update. I opted for a black base with a corresponding black flap for daytime, with a little golden sparkly number for evening, but that doesn’t mean I won’t be investing in a number of additional flaps to keep my bag on-trend. The bag itself is amazing quality and has much more room than you may think, fitting in all these essentials without a problem; the metal handle can be used across-body or over the shoulder, as well as being wrapped around the flap or popped inside to use it as a clutch. One of the best purchases I’ve made in a long time. What have you been storing in your handbag of late? Will you be picking up any of my faves?